Oftentimes, physical therapy and therapeutic taping go hand in hand. Maybe you haven’t had a chance to give therapeutic taping a try, but, you have undoubtedly seen it being utilized by others. Bright colored tape on bare shoulders, knees, arms, and legs are not uncommon, especially around athletes. This therapeutic tape has a name and a mission. Kinesiology Tape is designed to get you back in action in a quick & healthy manner. Does an injury have you sidelined? Is your mobility impaired? Discuss Kinesiology Tape with your Totowa NJ physical therapist. Kinesiology Tape is a special tape that offers support to tendons, muscles, and joints. The tape is utilized on mobile areas of your body to encourage movement & the bodies natural healing process. The tape is flexible and intended to make movement easier. While standard athletic tape is used to limit movement this therapeutic tape is meant to assist movement and get your body back in action! Ultimately there are many reasons why a New Jersey physical therapist would use Kinesiology Tape. It can work to address pain, assist movement, and improve performance. The tape assists with the sensory nervous system, interferes with pain pathways and helps realign joints. A physical therapy session that includes the application of Kinesiology tape can help keep your muscles flexible, keep your blood flowing and prolong the effects of other physical therapy methods over the course of several days. 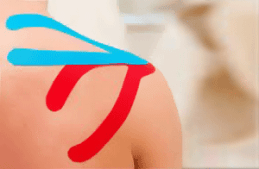 When Is Therapeutic Taping Used? Often taping is used after surgery during the recovery process. Due to the soft-tissue manipulation encouraging the body’s natural healing process, taping is a great way to speed up recovery times while still keeping you moving! Taping is also used to help struggling athletes improve the function of their muscles. The tape is also often used to control swelling, control muscle spasms, keep joints in place, and even help promote good circulation! Schedule A Physical Therapy Appointment Today! Contact our team at Elite Spine and Sports Care of Totowa today. Schedule your physical therapy appointment. Our educated, experienced, and knowledgeable physical therapists will help you learn more about Kinesiology Tape. Our physical therapists will help address your areas of pain and get you back in action while helping you learn more about therapeutic taping.